Construct the model of magma supplying system and clarify the process of upwelling and accumulation of the magma. Detect the change in the structure and state of the fault by the concentration of the stress. 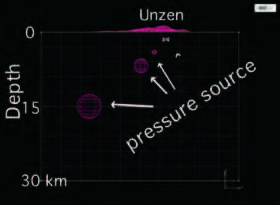 Detect crustal deformation and stress accumulation field using GPS baseline analysis. Grasp the state of interplate coupling by analysis of seismic waves. Beppu-Shimabara graben is very active. The focal mechanisms of crustal earthquakes indicate north-south or northwest-southeast extension. 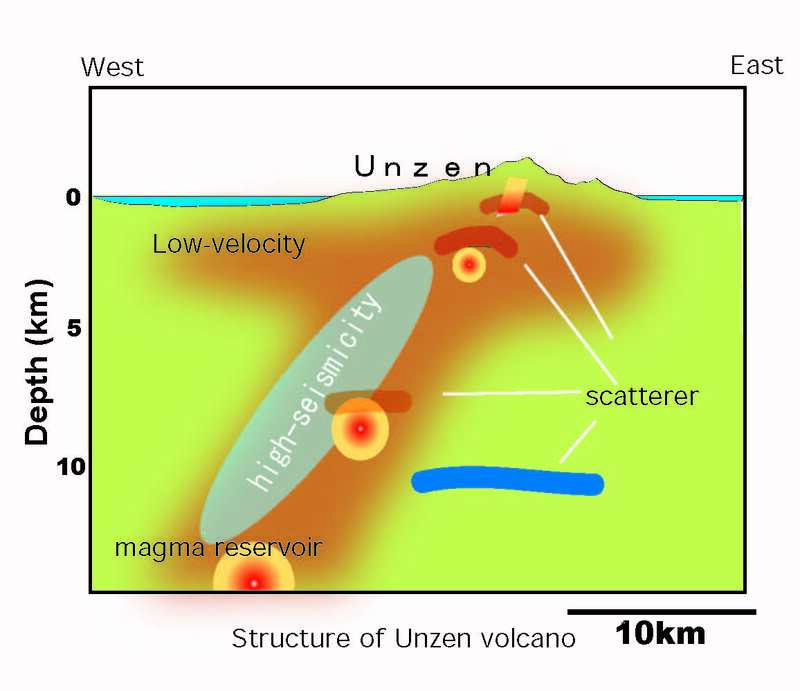 The Unzen graben, in the western part of the Beppu-Shimabara graben, spreads in the N-S direction at the rate about 1.4 cm/yr.The earthquakes associated with subduction of the Philippine Sea occur in a seismic zone inclining steeply from the Sea of Hyuga toward the upper mantle beneath the Kyushu Island. 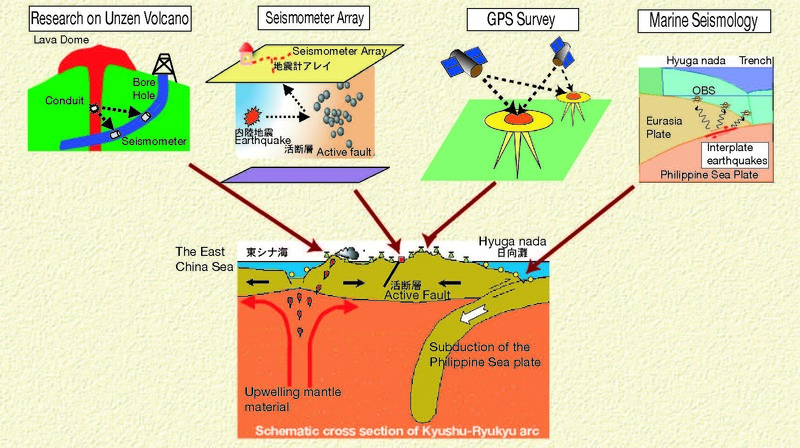 The subducting Philippine Sea plate arrives at 100-150km in depth just under the volcanic front on which Kuju, Aso, Kirishima and Sakurajima volcanoes lie. Low-velocity anomalies related to active volcanoes are imaged at 20km depth. 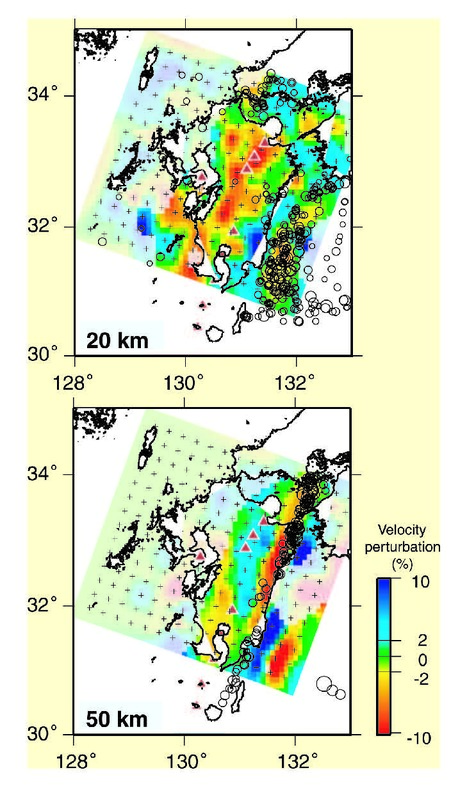 High velocity zone off e ast coast of Kyushu Island at 50 km depth corresponds to the subducting Philippine Sea plate. On the other hand, low-velocity zone is found along the east coast, which suggests serpentinized mantle wedge. The vertical cross-sections also image the high-velocity anomaly in the subducting Philippine Sea plate and low-velocity anomaly in the mantle wedge. it is necessary to understand the magma supplying system. Unzen Volcano in Kyushu, Japan, erupted in 1990-1995 and brought huge disaster to the surrounding area. We carried out intensive geophysical observations during and after the 1990-1995 eruption. 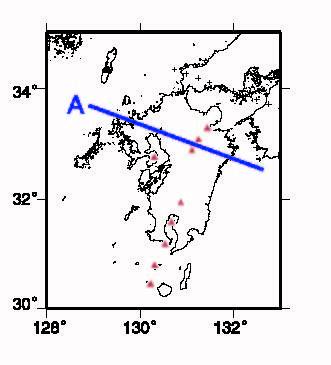 In this project, we tried to obtain the three-dimensional image of the magma supplying system beneath Unzen Volcano based on these geophysical data. Three approaches were adopted in this study, which are velocity tomography analysis, reflected/scattered wave analysis and pressure source analysis. 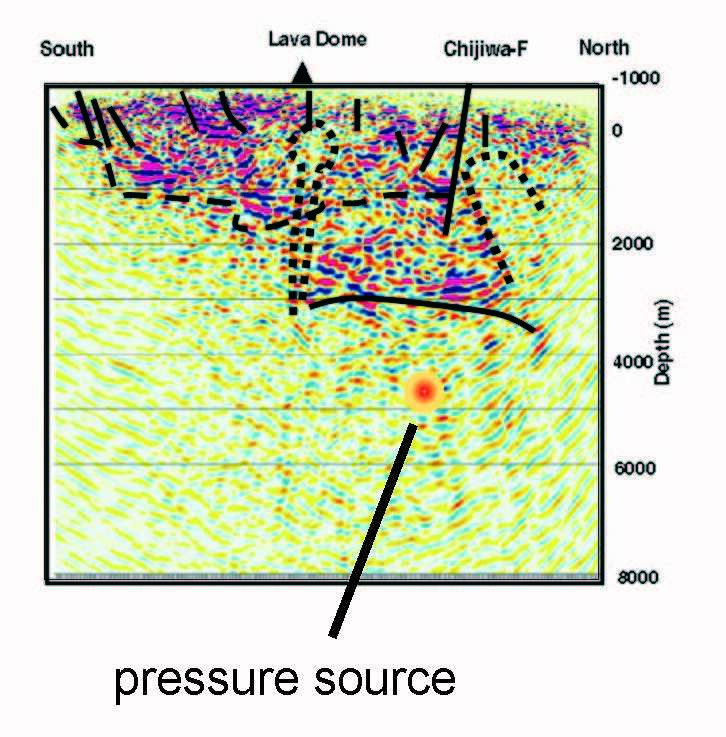 We revealed the existence of four magma reservoirs accompanying with strong heterogeneous media in the low velocity zone descending to the west. 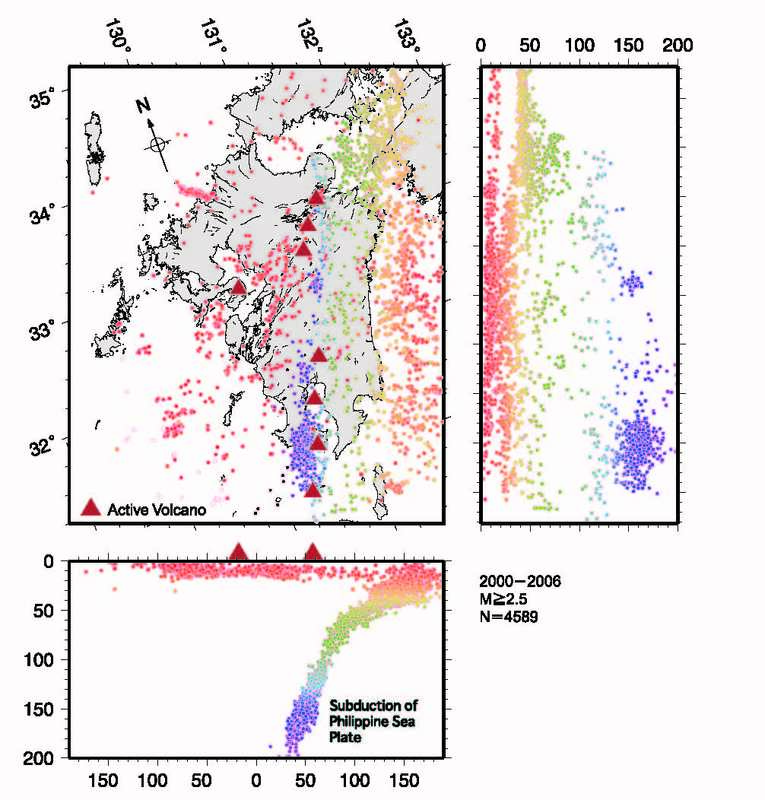 The hypocenters of volcanic earthquakes are distributed near the interface between low- and high-velocity zones, which suggests that the earthquakes were caused by fractures in the environs of magma ascent path due to the excess pressure of magma.